We woke up on Thursday morning to news of another mass shooting in America, this time at a California bar. It was college night. As the mom of two college students, I was shaken once again. It had only been eleven days since Jews were gunned down in their Pittsburgh synagogue. Twelve since a man killed two people at a grocery store after he was unable enter a predominantly black church nearby. Writers and publishers are producing a growing number of books for children and teens about gun violence. In This Is Where It Ends, by Marieke Nijkamp, readers witness a mass school shooting through the eyes of several narrators. Marisa Reichardt’s Underwater offers a thoughtful study of a school shooting survivor who suffers from PTSD. The Hate You Give, by Angie Thomas — in which a girl witnesses the police shooting her best friend, a black teen — is now a movie. These are important books. Kids need these stories as they struggle to understand what we are all struggling with: gun violence is impacting their generation. But what they also need are books that carefully examine our culture’s relationship to violence. 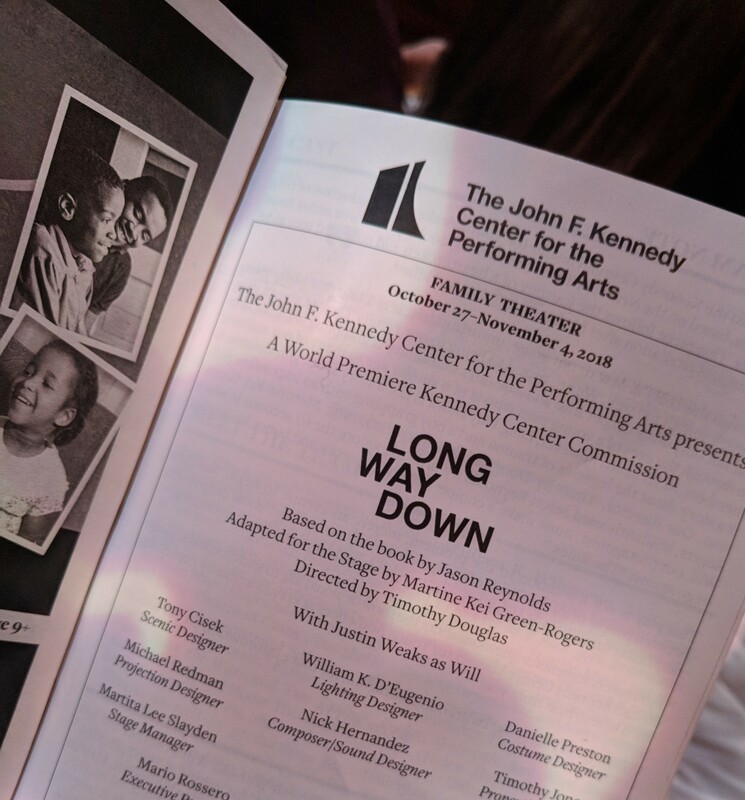 Last weekend, a friend and I saw the John F. Kennedy Center for the Performing Arts’ production of Jason Reynold’s Long Way Down. The verse novel was adapted for the stage by Martine Kei Green-Rogers and directed by Timothy Douglas. 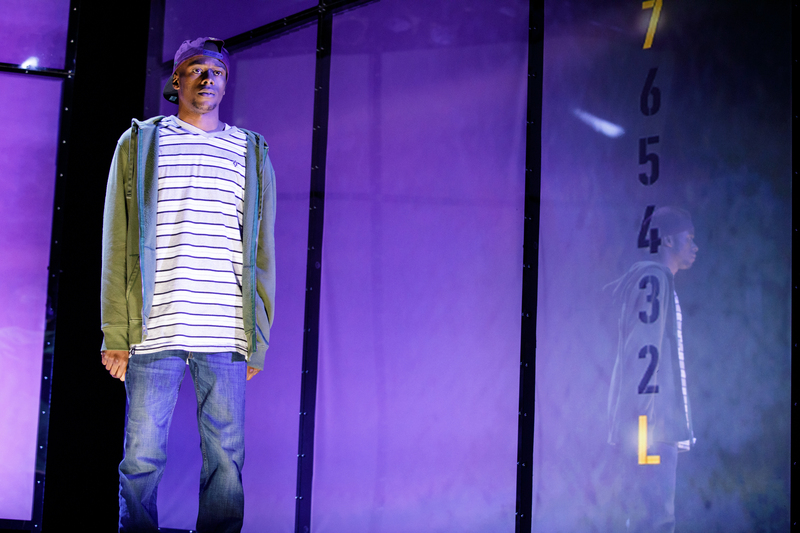 The play follows the book’s plot: When his older brother Shawn is shot and killed, fifteen-year-old Will follows the rules handed down by the men in his family: “No crying. No snitching. Always seek revenge.” The story takes place as Will rides his building’s elevator – gun tucked into the back of his pants – down to the street, where he plans to shoot his brother’s killer. During that ride, the ghosts of past gun violence in Will’s life visit him, forcing him to look at how each loss has hardened him. He begins to question what he is about to do. This production was, remarkably, a one-act, one-man show, with actor Justin Weaks playing not only Will, but also the people he has lost. That choice drives home an important point: Will carries each murdered friend and family member deep in his psyche. Each ghost’s visitation peels back a layer of Will’s armor, and we see him feeling emotions most boys are taught to hide: fear, grief, sadness. I won’t go into the wonders of the staging – how the coffin-like elevator was recreated, its mirrored walls reflecting the actor’s face as Will reflects on the people he’s lost. I am still trying to piece together my reactions to Long Way Down after reading the book, experiencing this production, and interviewing Jason Reynolds for a local television series called “The Writing Life.” What sets this book apart is that act of peeling back layers of grief. Readers connect with Will’s first-person voice straight away. We are already rooting for him to make a different choice, even as we understand his in-the-moment decision to punish the person who took his brother’s life. However, as Reynolds introduces us to the ghosts, the reader or audience member begins to understand intergenerational violence and how traumatizing it is for children, especially children of color. I was grateful that after the standing ovation, a facilitator was on hand to help people process what we had just witnessed. As audience members shared their stories – best friends, siblings lost to gun violence – I was in denial. “Gun violence hasn’t touched me directly,” I thought. But of course, it has. My friend was at our local mall in Columbia, Maryland, during a shooting in 2014. She sheltered in place in a cramped store-room for hours before the all-clear was given. On New Year’s Day, 2017, my neighbor’s fifteen-year-old daughter – my daughter’s friend – was shot and killed by a classmate who had stolen a gun and broken into their house. Another act of violence in our community was one of the inspirations for my recent middle grade novel, Takedown. On a winter evening in 2007, an ongoing argument between two groups of teens escalated. They went to an empty high school parking lot for a rumble. One boy, a highly-ranked wrestler in the county, brought a bat. He killed another teen that night. I remember sitting down with my son, who was ten years old at the time and part of the county’s tight-knit wrestling community. As a family, we talked about the idea that at any point that evening, the teens involved could have made another choice and walked away from the fight. In Long Way Down, Will’s elevator ride is his moment to decide whether he is going to walk away and step out of the cycle of violence. Books like Long Way Down are necessary, because they can help us talk with children and teens about the cost of violence, and what it means to walk away. Laura Shovan’s debut middle grade novel, The Last Fifth Grade of Emerson Elementary, won several awards, including NCTE 2017 Notable Verse Novel, Arnold Adoff Poetry Award for New Voices honor book, and a Nerdy Book Club award for poetry. Laura’s second children’s novel, Takedown, is a Junior Library Guild and PJ Library selection. Look for her next book, A Place at the Table, co-written with author/activist Saadia Faruqi, in 2020. Laura is a longtime poet-in-the-schools in her home state of Maryland. By Laura Yoo in Uncategorized on November 19, 2018 .